A Chief's Story of a Great Indian Fignt. THE PAWNEES SURPRISED BY THE SIOUX AND SLAUGHTERED—A MESSAGE SENT BY PRISONERS. 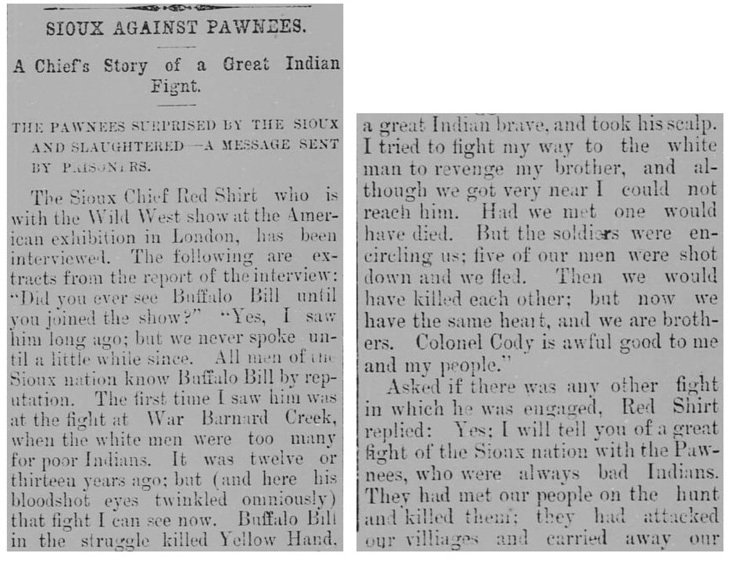 The Sioux Chief Red Shirt who is with the Wild West show at the American exhibition in London, has been interviewed. The following are extracts from the report of the interview: "Did you ever see Buffalo Bill until you joined the show?" "Yes, I saw him long ago; but we never spoke until a little while since. All men of the Sioux nation know Buffalo Bill by reputation. The first time I saw him was at the fight at War Barnard Creek,  when the white men were too many for poor Indians. It was twelve or thirteen years ago; but (and here his bloodshot eyes twinkled ominously) that fight I can see now. Buffalo Bill in the struggle killed Yellow Hand,  a great Indian brave, and took his scalp. I tried to fight my way to the white man to revenge my brother, and although we got very near I could not reach him. Had we met one would have died. But the soldiers were encircling us; five of our men were shot down and we fled. Then we would have killed each other; but now we have the same heart, and we are brothers. Colonel Cody is awful good to me and my people." 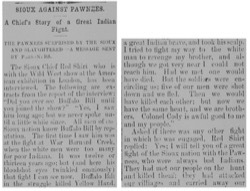 Asked if there was any other fight in which he was engaged, Red Shirt replied: Yes; I will tell you of a great fight of the Sioux nation with the Pawnees, who were always bad Indians. They had met our people on the hunt and killed them; they had attacked our villiages and carried away our children, and their young braves came like snakes in the grass and stole away our horses. The Sioux nation offered to make a treaty of peace with Pawnees, but the bad Indians refused, and the grand council of Sioux sat down to discuss how we should punish these bad people, and every Chief there spoke for going on the war path. Then we made ready to fight. It is fifteen years ago, and I was a young Chief then; but my father who was a great Chief, was on the war path, and I was eager to prove myself a great warrior in his eyes. I collected my young men and we set out, altogether 1,300 strong, under sixteen big Chiefs. The most experienced warriors were sent on two days' march in advance to scout, and scouts were thrown out on every side to guard against surprise. For eight days our braves marched against the enemy, and then some spies came back and told us that they had found the Pawnee village. 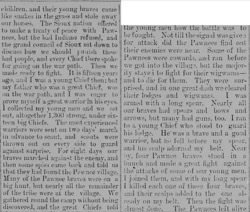 Many of the Pawnee braves were on a big hunt, but nearly all the remainder of the tribe were at the village. We gathered round the camp without being discovered, and the great Chiefs told the young men how the battle was to be fought. Not till the signal was given for attack did the Pawnees find out their enemies were near. Some of the Pawnees were cowards, and ran before we got into the village, but the majority stayed to fight for their wigwams—and to die for them. They were surprised, and in one great dash we cleared their lodges and wigwams. I was armed with a long spear. Nearly all our braves had spears and bows and arrows, but many had guns, too. I ran to a young Chief who stood to guard his lodge. He was a brave and a good warrior, but he fell before my spear, and his scalp adorned my belt. 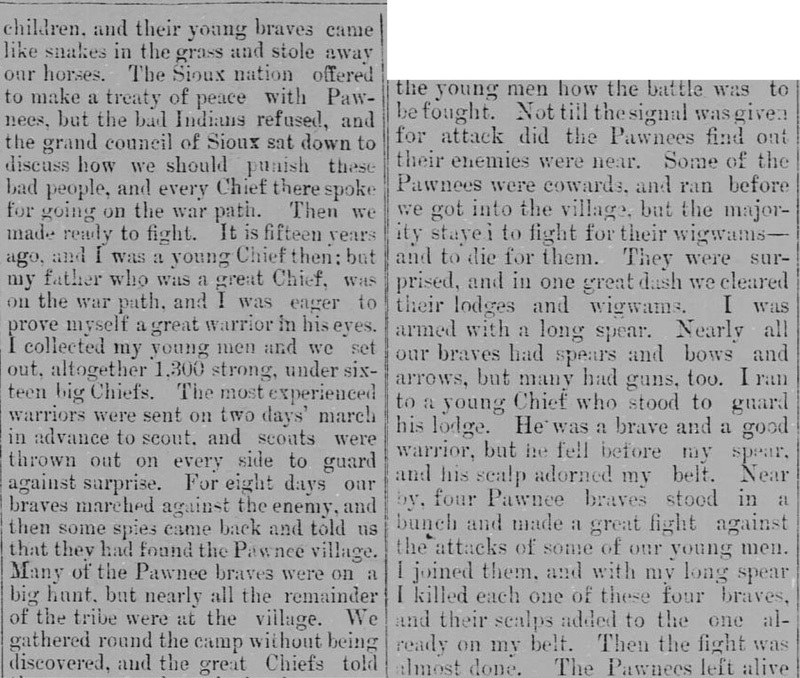 Near by, four Pawnee braves stood in a bunch and made a great fight against the attacks of some of our young men. I joined them, and with my long spear I killed each one of these four braves, and their scalps added to the one already on my belt. Then the fight was almost done. The Pawnees left alive tried to get to their fast horses, but our young men were too quick for them. It was a running fight, and they were scalped almost as they ran. I met three women running for the horses. Two were armed with knives and one with a club: but I killed all three. I did not take their hair. A brave boasts not of killing women, and a woman's scalp adorns not a Chief's Lodge. There was no hesitation about killing their women and children. They had killed ours, and revenge is sweet to the red man. 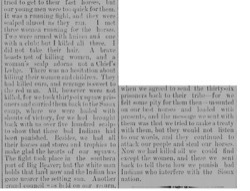 All, however were not killed, for we took thirty-six squaw prisoners and carried them back to the Sioux camp, where we were hailed with shouts of victory, for we had brought back with us over five hundred scalps to show that these bad Indians had been punished. Besides, we had all their horses and stores and trophies to make glad the hearts of our squaws. The fight took place in the southern part of Big Beaver; but the white man holds that land now and the Indian has gone nearer the setting sun. Another grand council was held on our return, when we agreed to send the thirty-six prisoners back to their tribe—for we felt some pity for them then—mounted on our best horses and loaded with presents, and the message we sent with them was that we tried to make a treaty with them, but they would not listen to our words, and they continued to attack our people and steal our horses. 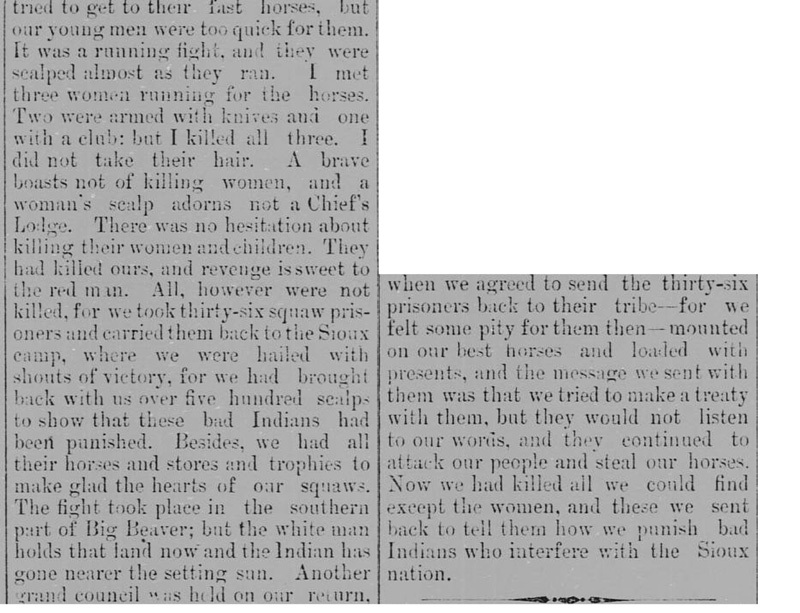 Now we had killed all we could find except the women, and these we sent back to tell them how we punish bad Indians who interfere with the Sioux nation.